Want to learn a little something about the majestic moose? 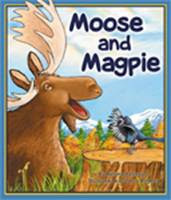 Moose and Magpie by Bettina Restrepo (hardcover edition) is for you!! Click here to view the e-book version. My review is coming soon! Subscribe to my blog! If you are already a subscriber, please let me know in your comment. If you are not, go subscribe and come back to let me know you did! Blogger Following will also count here. Follow me on Twitter! You can find me at tiftalksbooks. Be sure to also note this in your comment or come back to let me know. Tweet about it! Don't forget to mention @tiftalksbooks in the tweet for reference! Spread the word on your blog! Just remember to give me the direct link to your post to get the extra entry! Last day to enter will be on August 31st at 11:59 p.m. Central Time. I will notify and announce the winner on September 1st. Good luck and spread the word!! My son would love this! Please include me in this giveaway. My email address is laarlt78 at hotmail dot com and I am a follower. oh- and I'm a follower now! This book looks great! Count me in. honey2mommy (at) gmail (d0t) com. I didn't know a female moose is called a cow. How confusing. My kinder kids would love this too! I'm close to the deadline! I kept trying to remind myself all week to sign up!